Channeling my inner Estée Lauder? Or maybe my inner Mrs. Homegrown. It’s become obvious to me that as part of my natural crafty progression, it’s time to learn how to make creams and lotions. I already have so many ingredients I can use – I looked at a few websites for recipes & inspiration and found myself utterly overwhelmed. There’s so much advice: use water, use only distilled water, use rose water, don’t use water, use a stick blender, just whisk, use an emulsifier, beeswax isn’t a good emulsifier if you want it to last, beeswax is good enough, if you don’t use water it’ll feel greasy, don’t worry if it feels greasy because your skin is soaking up the goodness. And then there are the options: almond oil, grapeseed oil. coconut oil. jojoba oil. 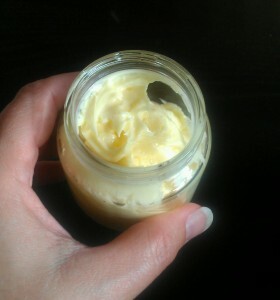 shea butter, cocoa butter, beeswax, essential oils, herb-infused oil. hydrosol, food-grade borax (omg, really? ), aloe vera gel, vitamin E oil, and some other oils and extracts i can’t remember how to spell, let alone pronounce. The reality is that there is some chemistry here – like everything else I seem to make, I should know the ratio of one thing to another so it works. I’m guessing this is where Estee Lauder’s uncle, the chemist, would step in for her, but in my overwhelmed state, I decided to wing it. So I channeled my inner Mrs. Homegrown at Root Simple , only I didn’t know it at first. I looked around my kitchen to see what i could find. I decided on a recipe and got started. I put a 1/4 cup of coconut oil in a bowl over a pot of simmering water. But I noticed that this recipe didn’t ask for water and since I have distilled water, maybe I should do something else. 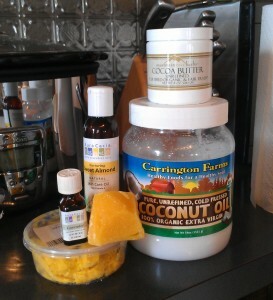 But the coconut oil was already on the stove… I added a tablespoon or so of shea butter and maybe that much cocoa butter (well, cocoa butter’s really hard and comes in a jar, so i basically chipped at it until I didn’t feel like doing that anymore). That’s when I frantically searched for some new advice – happening upon Mrs. Homegrown, I warmed some distilled water. I probably should have measured it and done the little bit of math to figure out how much water it needed, but things were melting and i was in the thick of it. I added about a handful of grated beeswax. Again <another deep breath>, I should have been more precise in figuring out how much of this I would need. And since i had forgotten the almond oil, i added some at the last minute (1 – 2 tablespoons?). My scientific process was non-existent by this point. i secretly hoped it wouldn’t be awesome because i’d never be able to reproduce it. Once everything was melted, I took it off the stove and added a few drops of lavender essential oil. i wanted it to have a light scent, nothing heavy. Now I had a problem – I had no idea how much water to add. no recipe i saw had the ratio of ingredients I’d used so i was on my own. I started whisking and adding the warm water. It turned out that i added a little too much. I finally had to switch to my stick blender, next time i’ll just start with that. And guess what? It was still pretty nice. No, not the perfect cream – but usable and though a little greasy, I like it. I used great ingredients so I’ll gladly use it up and try to make something else, especially since it took longer to write this blog post than it did to make the cream and the cost makes it worth it. I plan on using this pretty quickly (no preservatives) but if I don’t, I can put it in the fridge to extend it’s shelf life. 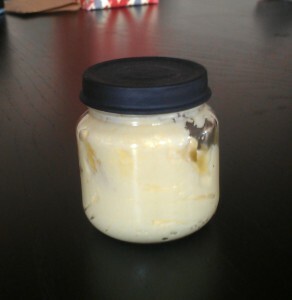 I have to admit that i found it really surprising that I could make a face cream off-the-cuff. Yes, I had to know a bunch of things to get that far, but a year ago, I couldn’t have imagined this so I’m grateful to have found a new way to create something natural for my family and to save a few pennies too.